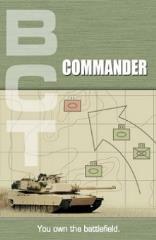 BCT Commander is more than a wargame, it's a complete simulation of land warfare. And what exactly does that mean? The easiest definition is that a simulation attempts to create an accurate interpretation of reality without regard to balance issues, while a game strives for balance more than realism. In BCT Commander units behave like they do in real life. You won't find perfectly balanced sides, nor will you find many conventions you're used to in gaming. For example, ordering a unit to start moving won't see it hitting warp five out of the gate. In real life military units don't do 0-60 in 5.5 seconds, unlike your typical RTS game.